The UPHA American Royal National Championship Horse Show opened on a blustery, snowy day with great anticipation and a lot of buzz. With prior notice that stalls were sold out, everyone knew it was going to be a BIG show. How many defending World’s Champions would be on hand to complete the final leg of the Saddlebred world’s unofficial "Triple Crown?" 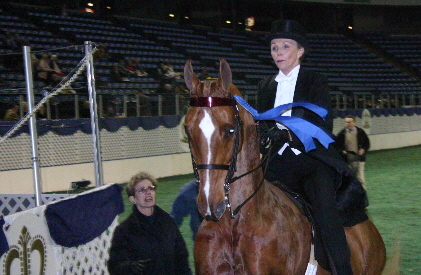 The crowd didn’t have long to wait for that answer as world’s champion amateur five-gaited mare and trainer Sarah Byers up for Amy Dix Rock earned the blue in the third class – Ladies Five-Gaited Mares – ahead of My Chanel and Owen Weaver. Only two classes later, the amateur over 2 reigning world’s champion, That’s Chicago and Tracy Garcia, took on the reigning amateur world’s champion of champions, Callaway’s Sugarplum and Barbara Manilow Goodman with Sugarplum coming out on top in a deep and hotly contested class. Interspersed among the first day and evening’s schedule was a wide range of classes for Missouri-Kansas horses, ponies and riders – a terrific stage for the region’s best talent. In a bit of unusual scheduling, all three open qualifiers for the five-gaited horses were held on the same evening. While the mare and gelding stakes were barn-burners that were deep in talent and numbers, the stallion stake featured only two, but highly entertaining entries. 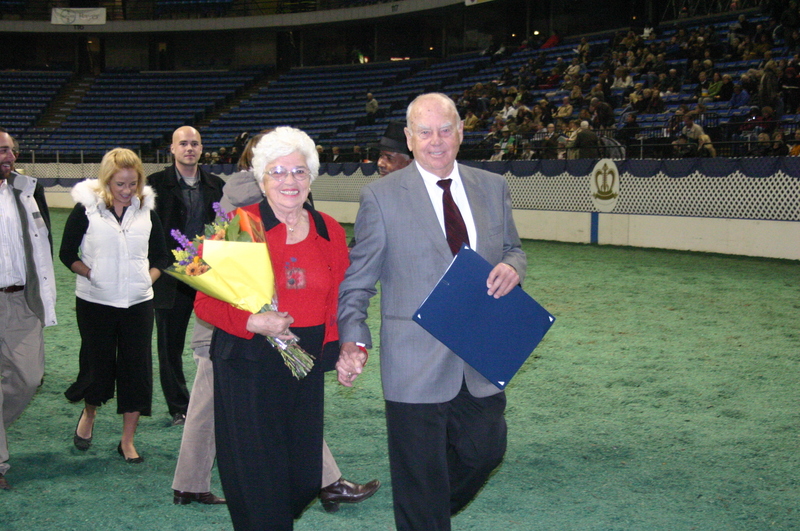 One of the industry’s most influential breeders, trainers, and clinicians was honored Tuesday night as the American Royal Horseperson of the Year. American Royal board member Rick Curl made the presentation of this prestigious and well-deserved recognition to Dr. Alan Raun. 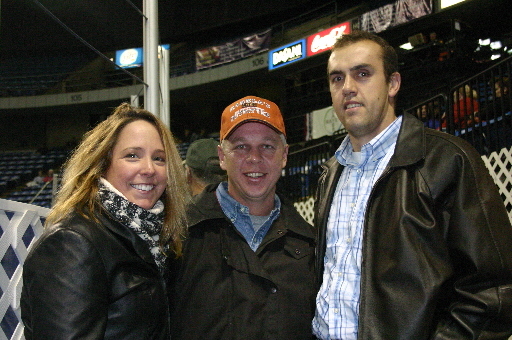 The evening’s most humorous moment took place just outside the ring. The open park horses were lining up at the end of their class; the organ and crowd quieted for the ribbons to be announced. All of a sudden a small voice rang out, “Go, Daddy, go!” It was young Ryan Visser, sitting in the lap of her granddaddy, James Orr, calling out her support for her daddy Neil Visser who just happened to line up in front of her. 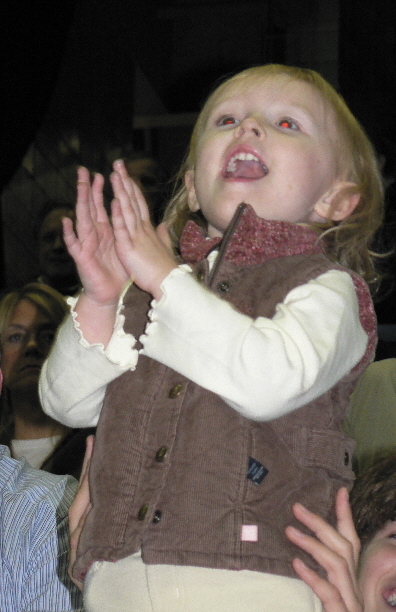 The crowd’s attention seemed to encourage Ryan as she continued to call out to her daddy. The entire arena seemed to stop what it was doing to listen to little Ryan. 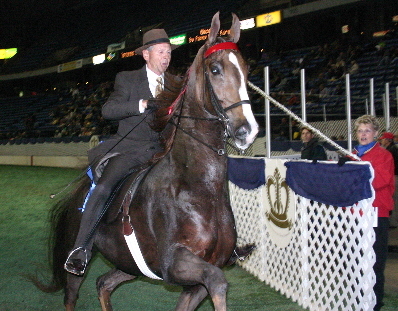 With the distraction, announcer Peter Fenton had to make an effort to recapture the attention of the exhibitors repeatedly asking them to break the line-up to receive their ribbons. 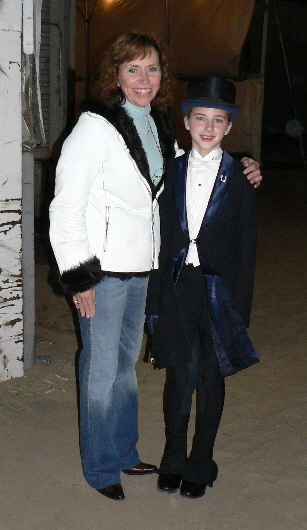 It just goes to show that there is always room for family moments even at the most serious of horse shows. 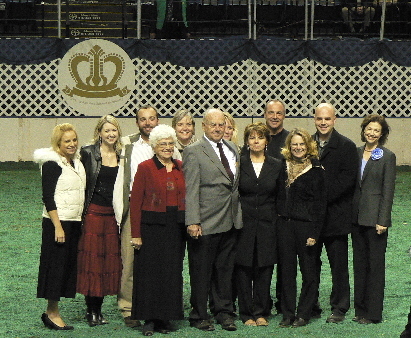 These are a few glimpses of the first day at the American Royal. Some photographic highlights follow. Stay tuned for more coverage each day this week.